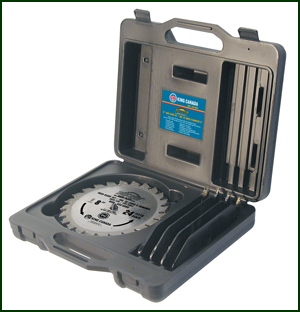 $99.99 Handles materials from 5/16" to 1-1/4" thick and widths up to 12"; unit includes 1/2" aluminum template. 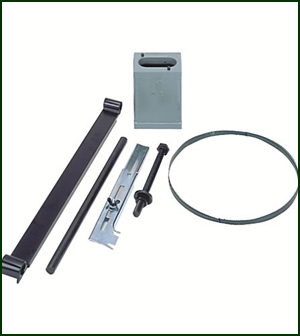 Extends from 19" to 52". 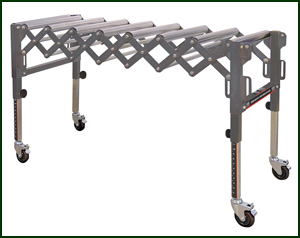 Raises from 24" to 45" from the ground. 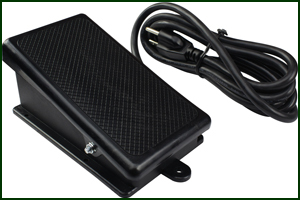 Can be manually flexed to a curved position. 9 Solid 2" x 20" conveyor rollers. 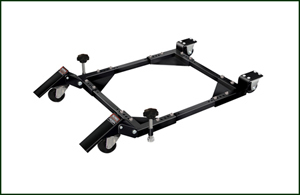 4" heavy duty wheels with locking castors. 300 lbs maximum capacity. 30 or 50" Rip to right of blade. 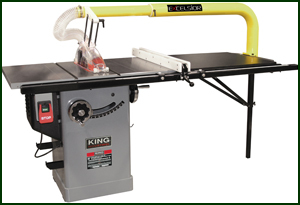 These fence systems were designed to fit King KC-26FXT and many other brands of imported and domestic table saws. Router table attachment fits most table saws having a 27" deep table. Heavy duty cast iron table with 4-way crossed "T" slot. Aluminum extruded fence. 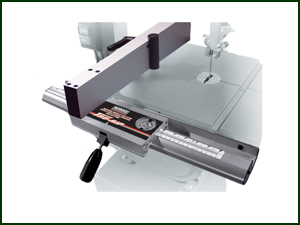 Can be mounted to right or left side of table saw. 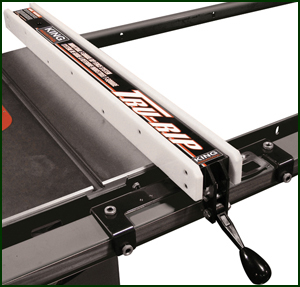 Router table size 20" x 27"
T-Slot (4-way) 3/4" x 3/8"
Fence board sizei (each) 12-1/2" x 2-3/4"
Designed for use with 10" - 14" table saws. Built-in dust collection system with 4" dust collector hookup and large transparent blade cover for more efficient dust collection. 4" Main boom with telescopic 3" inner boom. 3" Lip on extension table is required for installation. 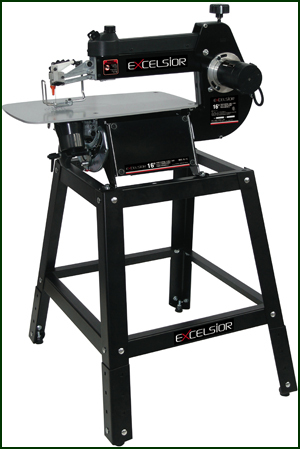 Table saw, dust collector and 4" dust collector hose not included. 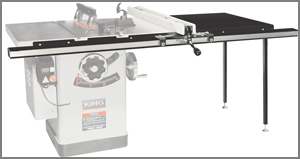 Distance between blade and extension 39-3/4" - 69-5/8"
Melamine extension table with 2 support legs (50" - 52" rip). Fits models KC-10JCS, KC-24FXT, KC-26FXT and KC-10KX. 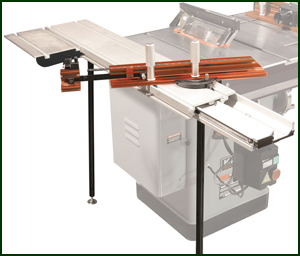 Sliding table attachment fits most table saws having a 27" deep table. 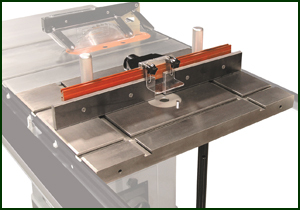 Heavy-duty aluminum extruded sliding table with a linear guide mechanism for accurate cuts. 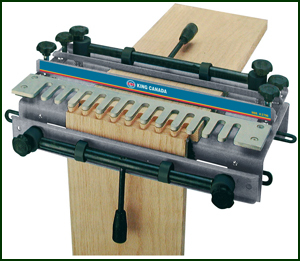 Telescopic crosscutting fence with built-in miter gauge and adjustable flip stop for accurate repeat cuts. Comes with extension table and 2 support legs. Sliding Table size: 9" x 47"/Extension Table size 9" x 13-1/4". 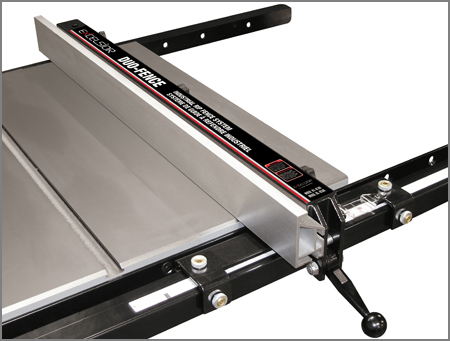 Maximum Sliding Table Travel 55"
Length of Fence 30-3/4" - 37"
Designed to fit cabinet saws and contractor saws. Carbide tipped 24 tooth AT-B-R dado blades. 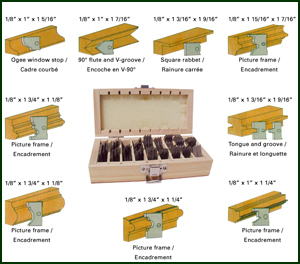 Cuts grooves from 1/8" to 13/16" wide. 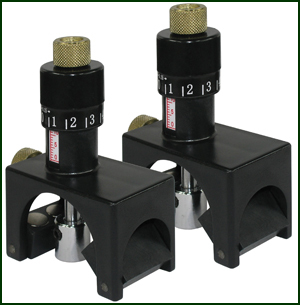 5/8" arbor, 7,000 maximum RPM. Combination of bevel-teeth and rakers on the outside blades produces grooves and rabbets whcih are flat bottomed. 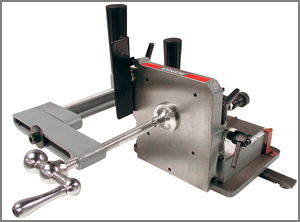 $99.99 Increases the spindle turning capacity to 38"
$109.99 Increases the spindle turning capacity to 44"